Since I’ve been updating our survival pack, I’ve been doing a lot of reading online about 72 hour packs. From what I can tell, there are basically two sources of information. Government emergency management agencies, such as San Francsico’s, and survivalist / “prepper” websites. The professional sites suggest you purchase different items, but if you want a review and comparison of the different choices, you’re stuck with the survivalist sites, or at least that what shows up when you google “survival packs” and “72 hour bags”. Reading survivalism formus is like taking a trip to a parallel world, that is both strange and familiar at the same time. One minute they’re reviewing pocket water filters and reading topgraphical maps, the next minute it’s secret DHS armies. There are two big difference between the survivalists and their archnemesis FEMA: the types of disasters to prepare for, and what to do in the case of these disasters. FEMA and other emergency management agencies focus on natural disasters. Earthquakes, tornados, floods, and the like. 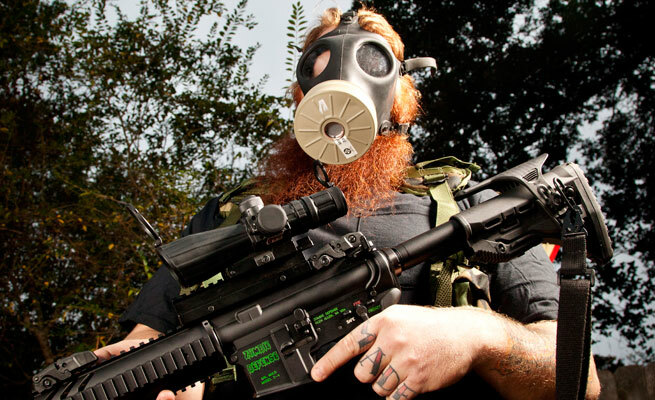 The survivalists worry about those too, but they add electromagnetic pulses, global pandemics, nuclear / biological / chemical attacks, global economic collapse. Now in all fairness, with the exception of economic collapse, FEMA plans for those contingencies as well. The real difference between the two is the strategy on how to deal with these calamities. Professional disaster management agencies (both governmental and NGOs) advocate a wait for help approach. The survivalists on the other hand advocate running to the hills. There’s something I find romantic about taking to the hills and hiding out. It’s the same part of me that thought Red Dawn was awesome. Of course, I as eight years old then. It’s all fantasy of course (as evidenced by the preoccupation with AR-15s and tactical dress). I can understand how someone goes from planning for 72 hours, goes to planning for a week, and then months. It’s a problem to solve. It’s a hobby. The problem is, that this goes off the rails into crazy gun nut fantasyland rather quickly. Cities are full of killer atheist communists where crime is at all time highs, so you need to escape to the moral Christian countryside. Society collapses, but you still need to carry gold coins, your FOID card, and passport. (I really wish I could find the link to the kit that listed that as a requirement.) All of which are demonstrably not true. When 9/11 happened, there wasn’t mass panic in the streets. Instead people pulled together to help each other. When Katrina happened, contrary to initial reports,mass anarchy simply didn’t happen. People just don’t act the way they do in the movies. Wild gangs promote hero fantasy narratives for the disenfranchised. Post-earthquake Neighborhood cookouts don’t. This entry was posted in other, personal and tagged guns, survivalism on August 18, 2013 by jonathan.